It's mid-August and I feel like the panic has set in; that feeling akin to the mid-December panic when I realize everything is happening too fast, the end of the year is rapidly approaching and I'm terrified that I haven't accomplished enough, experienced enough, or lived enough. I think it might be healthy to take a moment and focus on what I did do this summer, rather than what I did not. Some highlights were: having a picnic at the beach, seeing a fireworks show, getting to do the thredUP style challenge with Meg, seeing a Small Black and Snowmine concert in Boston, renting bikes for the afternoon, attending a small film festival in New York, filming to be on a TLC show, spending a weekend in Cape Cod, and going kayaking for the first time. Maybe I shouldn't be feeling so panicked, but I still wish summer were longer. That dress on you with the jewelry - on point! I think we all wish summer was longer, but it sounds like you've had a great one!! I love this dress on you! So hard to believe summer is almost over already. You look absolutely stunning in this dress!! I'm feeling the same way! I'm freaking out that summer is almost over, but when I think about it, I had a lot of fun adventures in the last months! You definitely did a lot of fun stuff this Summer! I did too, but I still feel like I need to do more, ha ha! Summer really did blow by, but for some reason I'm always ready for Fall when it gets here! You look gorgeous in this dress! I love the bright stripes! Great summer look, fun dress and it sounds like you've had an awesome summer. Have a great weekend! You always make what should be a very simple outfit looks AMAZING and chic! Love the accessories and so feeling that anchor necklace. GORGEOUS! Yes, summer is flying and I too feel panicked that I have pinned so many things but haven't gotten through nearly any of it. Life I guess. I totally feel you. But that is a good way to think about it for sure! I don't think I remember you talking about the TLC show--did you? That is exciting! And I'm always down for a good picnic or bike ride! Love this pretty striped dress! That dress is co comfy and chic and you wear it well. TLC show. .when does it air? love your hat! and your anchor! Great look, I love that dress! You may be feeling panicked, but it sounds to me like you packed all kinds of summer fun in this year. I'm afraid the best of the summer weather has already ended in Vancouver - we've had nothing but clouds and intermittent showers since Tuesday - and when I try to sum up what I've done with the past few months I come up with... Nothing particularly summery. There hasn't been a single beach trip. I've had a few slurpees, but not even any ice cream. Shameful, really. So if it helps, you can compare your summer to mine and feel accomplished ;) Not to mention that your summer style has been just impeccable this year. I absolutely love your dress! I can relate to your panic, yet it sounds like you have done so much this summer. Sadly this year I haven't done much of enjoying it. We have been super busy through the week and super lazy through the weekends. We had just once bbq with our friends and I think the beautiful summer weather might be gone. It feels already more like early Fall. You look so gorgeous in this fab summer dress. Ooh what show? Well at least you look like the epitome of a lovely summer day even if the days are rapidly dwindling! That stripey dress is gorgeous on you! And it sounds like you've done a lot this summer! But I understand how you feel--I never feel like I've done all the things I wanted to do each year! This dress is great on you! I love the nautical spin you gave it with the jewelry and white bag! Your dress is really pretty and love this pics, chic casual. Filming to be on a TLC show?! That's amazing! How fun! That dress is so adorable! I love your anchor necklace! Hello, amazing body! This dress fits you like a glove. Still love that white purse. Filming for a TLC show? Comcerts? Picnics? A collaboration with Thredup? Yeah, I think you've done a LOT. Sure as heck beats what I've done all summer. I've either been chained behind a desk 8 hours a day or been sick. Waahh! I also think I'm alone in hating summer. I love fall and winter. Although, this summer has actually been okay. No heat waves so far. Sweet! that dress looks amazing on you! I love the white bag with the red tassels too! great post! I have to hear more about you being on a TLC show! I feel the same way about the summer...it has gone by way too fast and I didn't get to do half of what I wanted! You look so pretty in that dress and I want to hear more about that TLC show so I can check you out when it airs. I wish summer was longer too. It goes so fast! Your dress is so nice you look amazing. gorgeous outfit. i love your anchor necklace. 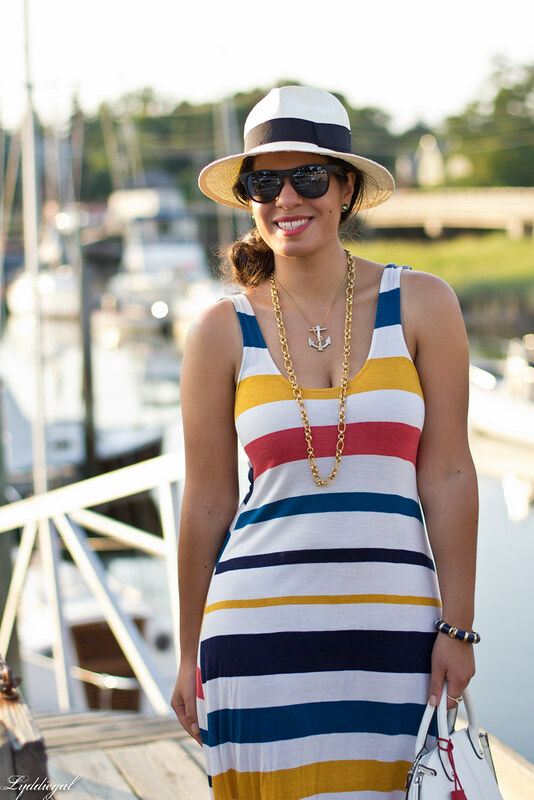 I absolutely love this dress and that necklace is awesome...I love nautical! That dress is very pretty! The bag is amazing! That's such a lovely dress. Perfect for the summer days. See, you have done so much! Sometimes you just have to list things out. I actually had to do the same thing awhile ago to put myself at ease. So yay you, Lyddie! You're accomplishing and thinking about accomplishing more, so that's half the battle. I was in love with this outfit when I saw it pop up on Flickr! Those colors, them accessories. Work it girl. It sounds like you've had such an amazing summer! I'm certainly not ready to see it end. I've been feeling that same way lately. 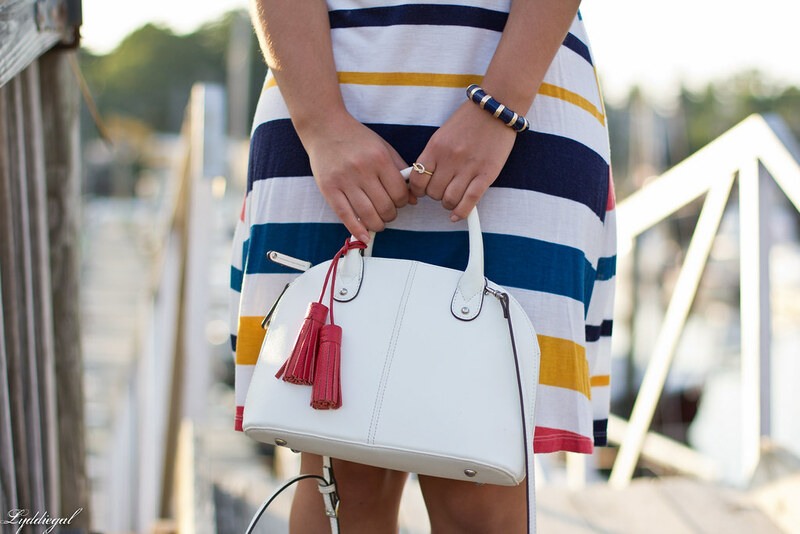 I love how the red tassels on your bag match your dress perfectly, that's such a fun detail! Wow! What a lovely look!! The stripes are great and I adore the colors! Your bag is amazing. I'm completely agree. I feel like this August has gone by faster than previous years. I want to put the breaks on. I really like this dress and your necklace is so pretty! You look adorable! This is such a perfect Summer look! Love the colorful stripes! This is the perfect dress for summer!!! Sounds like you are having an awesome summer so far! 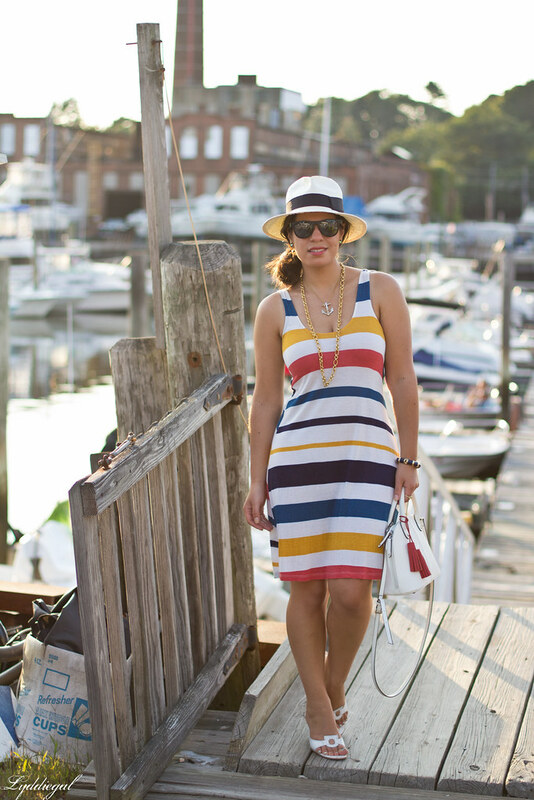 Love this nautical outfit with the perfect setting. Sounds like you had a pretty full summer to me! Plus it's not over yet! Still have a little time left to cross some more things off your list! gorgeous! can we talk about your perfect curvy figure? :) LOVE! And, totally agree it's nice to reflect on what you did instead of what you didn't. Great thinking. 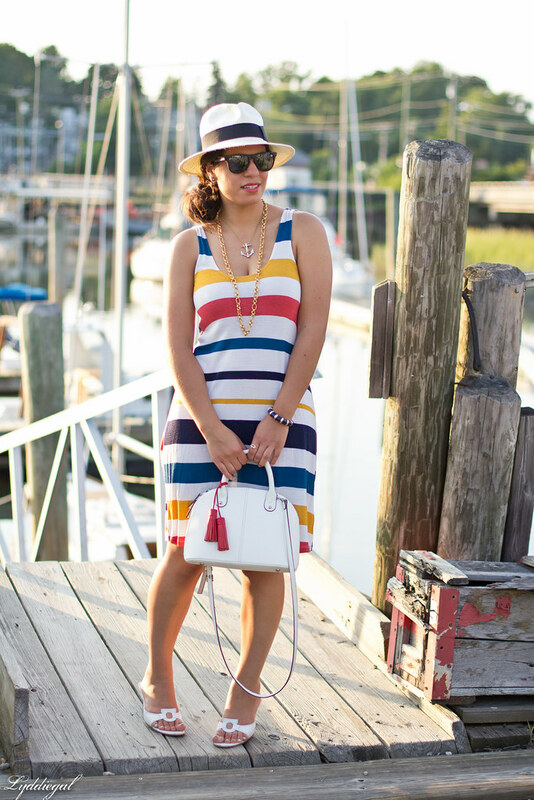 That multi colored dress is such a fun spin on being nautical! Hope you had a lovely weekend! Oh, I'm starting to panic too! I hate when summer is coming to a close :( This striped dress is gorgeous on you, and I love your jewelry! I know the feeling, completely, but it seems like you've done a ton this summer! And I love this summery look, great anchor necklace. Well I think you've done more than I have done in several summers…. ! I can never get enough of the nautical trends. Nobody pulls a hat off like you! you look fantastic!